Vehicle manufacturers are increasingly using vehicle simulators to improve new vehicle performance while reducing the time and cost it takes to get a new design to market. But how accurately do driving simulators re-create real world vehicle testing? In a competitive market, manufacturers such as Jaguar Land Rover are constantly seeking to improve product quality, while at the same time reducing costs and time to market. An ever-increasing emphasis is being placed on computer modelling and simulation of vehicles, all along the product development process. To allow human test drivers to experience and interact with these new car models before they are ever built as physical prototypes, the use of driving simulators would be highly desirable, but it has not been clear to what extent simulators yield similar testing results to real world vehicles. Questions remained over whether simulators could re-create similar subjective driver feedback and whether the type of simulator made a difference to the results. 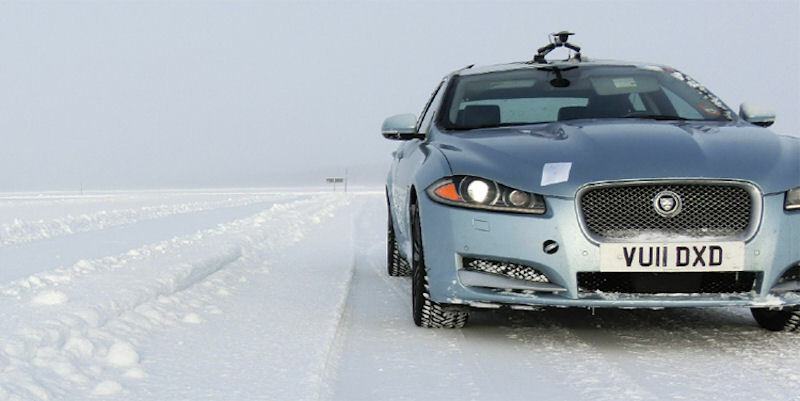 A collaboration with the University of Leeds Institute for Transport Studies and Jaguar Land Rover, supported by the Engineering and Physical Sciences Research Council (EPSRC) Programme for Simulation Innovation (PSi), has worked to answer these questions by comparing real vehicles and their simulated counterparts. Driving simulators are a useful tool for manufacturers to save time and money during new vehicle development. One major result from our research was a comparison of anti-skid system testing between a real car on a frozen lake in Sweden with a driving simulator replica of the same scenario. We found that the results in the simulator accurately reproduced those on the lake. We also found that simple and inexpensive simulators can often be adequate for testing driver experience and safety of in-vehicle technology, such as infotainment systems. Working with the Leeds team in the PSi project has provided us with a number of new and valuable insights into how to select the best simulator design and set it up to accurately match the real-world environment in relation to a range of driving experiences which will allow us to gain competitive advantage in this field. How can driver behaviour and vehicle testing outcomes be meaningfully compared between real and simulated driving? What type of driving simulator is needed to obtain driver behaviour and vehicle testing outcomes that are similar to those obtained in a real vehicle? The sensory experience in a driving simulator will never perfectly replicate real driving – how do the sensory differences in a simulator affect drivers and their behaviour? We compared testing in real vehicles and the University of Leeds Driving Simulator, which was altered to replicate different types of simulators, for example with varying motion feedback capabilities. Simulators proved to be accurate for testing anti-skid technology, potentially limiting the need to send vehicles to remote locations, saving time and money for manufacturers. For testing in-car technology, simulators were shown to be a very useful tool in the early stages of development, with only simple simulators being required for many types of testing. We demonstrated that it is important that vehicle testers remain unaware of the changes made between tests to vehicle specifications affecting handling and driving feel as this can otherwise bias their perception of the way the car handles. Simulators need to provide motion feedback when testing for stability, handling, feel and driving experience, because the sense of balance, as well as vision, directly influences how a driver handles a car.